After his book on Yorkshire, published in 2016, Stuart Rayner has moved over the border and written an interesting history of Durham C.C.C, the last of the eighteen First-class counties to be formed. Since their inception, Durham have won the coveted County Championship on three occasions and progressed as a one-day outfit. They can number Ian Botham, Dean Jones, Stephen Harmison, Paul Collingwood, David Boon and Mike Hussey amongst international players and have in the Riverside ground, one of the most attractive grounds. They have always brought on local talent in addition to their international stars. Sir Ian Botham has since proved to be an energetic chairman of the club. Not all has gone to plan, though, and financial issues led to Durham being relegated with a substantial docking of points for the following season which meant the likelihood of returning to the First Division was remote. Drawing on the experiences of many former players, Stuart is able to not only paint the historical picture but also go in depth to the winning of tournaments and the more recent financial plight. Many people have been interviewed thus giving even more credence to the story of the county. The role and impact of Geoff Cook as a player, administrator and coach is mentioned throughout the book as are board members who have done so much in making the county what it is. International fixtures have had an unwelcome bearing on the county's finances especially where, for example, one Test finished early thus resulting in a loss on gate receipts. With England featuring amongst Chester-le-Street's three World Cup matches this summer and with Ben Stokes within the England ranks, a more profitable summer might be reasonably expected. 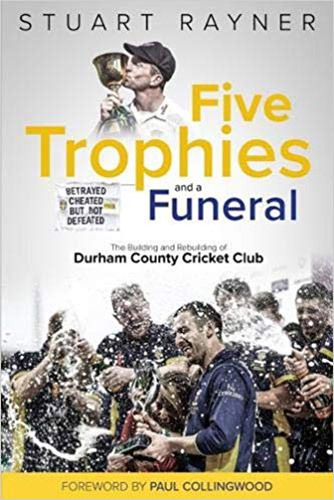 Five Trophies and a Funeral goes into great detail and is a very worthy history of Durham C.C.C. There is a lot of coverage of matches and figures in making this an important history of the club.